I don't know about you, but there are a few select things that make a house feel like home for me. One of the main things is a cozy smell that fills the air and gives me a sense of calm. Having just recently moved, I don't have much in the way of decor out to personalize the space to make it "ours" just yet. This is when I turn to my Home Fir the Holidays candle by Farmhouse Fresh. Moving right before the holidays (or any time for that matter) is a huge undertaking. This is the time of year we all want to feel the warmth of the holidays and put up decorations to make our homes feel even more "homey." I hate taking down Christmas decorations, I want them up as long as possible! This year I've had to wait to even put them up because everything is in boxes. The one thing I've kept easily accessible is my Farmhouse Fresh candle in Home Fir the Holidays. This candle fills the air with the scent of a Frazier Fir so you get the fresh aroma of a Christmas tree every time you burn it. Our tree is artificial so I never would have gotten to enjoy this scent if not for this candle. I love enjoying the scent of a real tree without having to clean up after one! Not only does this candle smell amazing but it serves as a Christmas decoration all on its own. It comes with its own green "sweater" with little sheep and pine trees on it. Perfect for the holidays! 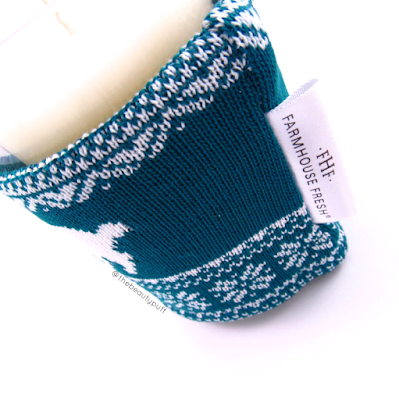 Farmhouse Fresh also makes a Spiced Rum & Bunny Slippers candle that is a mixture of citrus and spice. 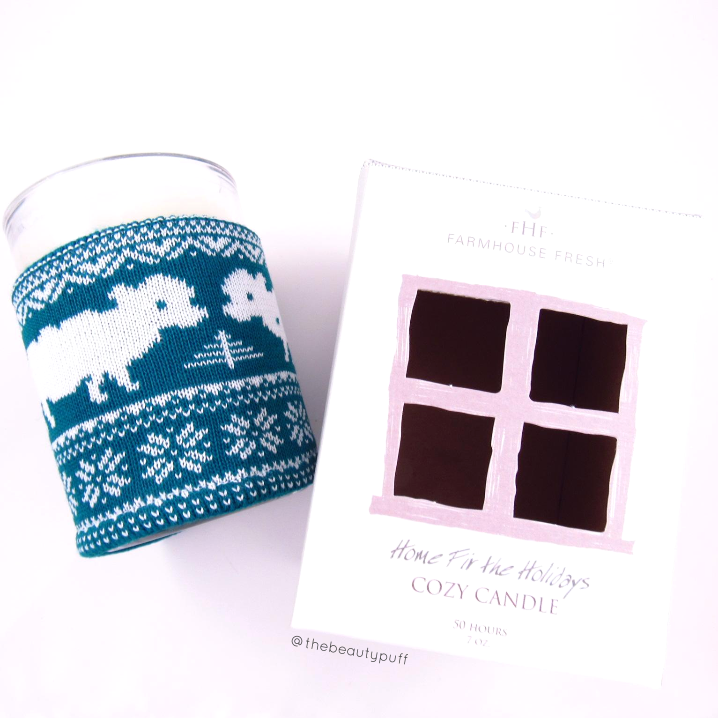 That candle features a red "sweater" with cows and hearts on it, so cute! Once the candles is done, I will definitely keep the jar and sweater as a Christmas decoration! These candles both feature a 50 hour burn time, giving you plenty of time to cuddle up and enjoy their enticing aromas. If you are looking for a thoughtful Christmas gift, or just want a cozy treat for yourself, you'll love the candles by Farmhouse Fresh! 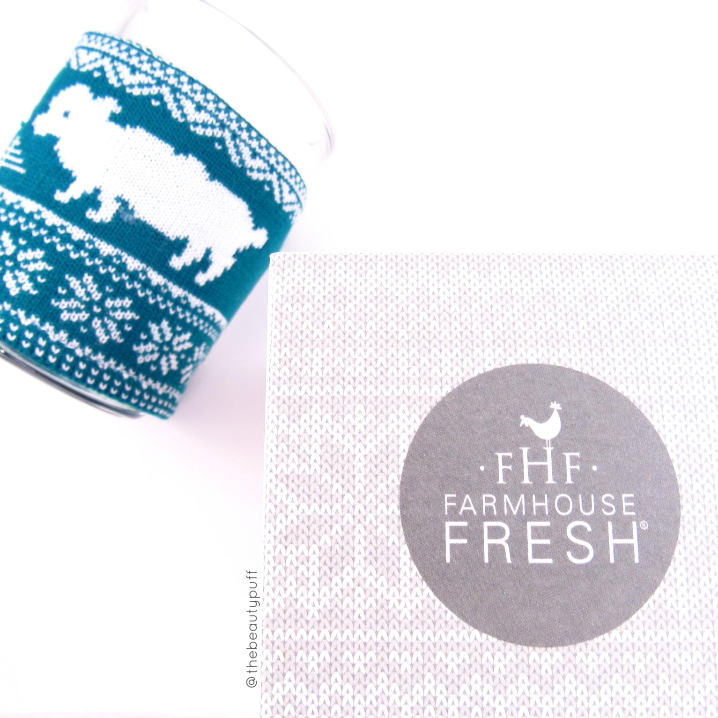 If you want more gift ideas, or missed my last Farmhouse Fresh post, click here!